Even though I’m a latecomer to the Hellboy universe (I’ll admit I started reading the comics after the first movie came out) he quickly became one of my favorite heroes in the comics world. I just loved the premise of the series of a demon trying to be human. And as a byproduct I enjoyed reading about the other folks that served with him in the B.P.R.D.–Liz, Abe, Johann, Dr. Corrigan–and so many others. I love the fact that they’re such a diverse group some with powers, or ancient mummies, or just regular human beings not afraid of the things that go bump in the night and that they did their best to protect humanity…even if that meant causing other problems, such as with what’s recently happened in the B.P.R.D. universe. This is the second collected volume in this storyline where the world is being overrun by monsters and distrust and disillusion run rampant in B.P.R.D. Hell. A living Hell. That’s the best way to describe the current condition of the world. Strange and deadly creatures haunt the landscape and they hunt the humans they encounter. But there are survivors. A strange young woman named Fenix is able to lead a small group of wanderers through danger with what seem to be psychic visions. And B.P.R.D. wants to talk to her. They’re still stretched thin with Hellboy and Liz both MIA and infighting and bickering may lead to the destruction of the team. In other parts of the world strange new and bloody cults have arisen, some practicing the art of human sacrifice. And a former B.P.R.D. agent maybe all that stands in their way from destroying everyone. 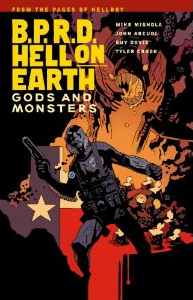 I’m still a bit behind in the B.P.R.D./Hellboy Universe and what exactly happened to cause the vast destruction (and the volcano in Houston), but I’m quickly catching up. If you’re like me and a bit behind I’d recommend reading the previous volume just to understand some of the tension a bit better, but you can still jump in on this volume easily enough. It’s just as action packed as the first volume in the series and will have you on the edge of your seat as you wonder what will happen next, not just to Abe and his team, but to the reappearance of a lost agent and the other characters we encounter. It’s another solid writing job by Mike and John and I can’t wait to see where they take us next in this storyline because it promises to be a thrilling ride. The biggest thing about the artwork in this collection is that it’s the transition from series regular Guy Davis to newcomer Tyler Cook. In some ways it’s a bit jarring because the styles of the artists are so different and it’s strange to see the characters depicted so differently in the same storyline (it’s normal to see them depicted differently in different storylines, less so in the same one.) Guy’s style is more loose and sketchy, which is great for depicting movement and emotion. It’s like the characters almost vibrate off the page. Tyler’s style is slightly more realistic, especially in how the characters move. But…over the two styles I think I actually prefer Tyler’s because the characters look and feel more realistic vs. the somewhat at times cartoony style of Guy’s style. But both artists do an excellent job of making the reader feel at home with the characters, someone that we can reach out and touch. If you’re an avid Hellboy/BPRD fan then this is definitely the book for you. But if you haven’t read the first volume go and pick that up first then come to this one and be prepared for a wild ride. I look forward to seeing what comes next.